Hello! Hello! Oh, my - I hope you are a lot cooler where you are than here in OKC. Yikes, it's been hot enough to fry an egg on the sidewalk or maybe on your car hood! It's also been a fun weekend: I've been practicing with the Fuse Tool and creating with a darling stamp set from Neat & Tangled. And creating a new printable. And filming two videos. I must be stuck on kitties - I have once again got kitty projects!! It's been too hot for my kitty, too. He's just lazing around (as if he doesn't always do that anyway). And he interrupted one of my videos. BAD kitty! Both projects make use of the WRMK Fuse Tool. I think it could be quite addictive. Next up is a window shaker card. The window is cut all the way through the card. Very cool! The video shows how to make the card including the shaker pocket made from packaging using the Fuse Tool. And it shows how I put the kitty together (I wanted his paws to hold the milk bottle,not be behind the bottle). Also, how I made the cute tiny straw! Download the Purr-fect Download HERE. Dropbox can work differently for different people. After you see the image, wait a moment. A download button will appear in the top right corner. if the download button doesn't appear, try right clicking on the image and saving. If neither works for you, don't hesitate to email me. I will send you the files through email. I hope even if it is hot where you are, you are having fun creating something that makes your heart happy! I'm as happy as my kitty is when he's lapping up milk! oh my! this is 'meow-velous'! I have been eyeing that fuse tool for awhile now and may have to jump on the bandwagon and get it! Oh, these shaker are pratically purrr-fect!! :D Great use of the fuse tool, I must have this :D Adorable images and designs! !Thanks for sharing!! Two lovely sweet projects Lori. Both are just adorable. It has been rather hot this side of The Pond for the last week - very humid. Not great for travelling to & from work. Your posts are just so happy and so fun! 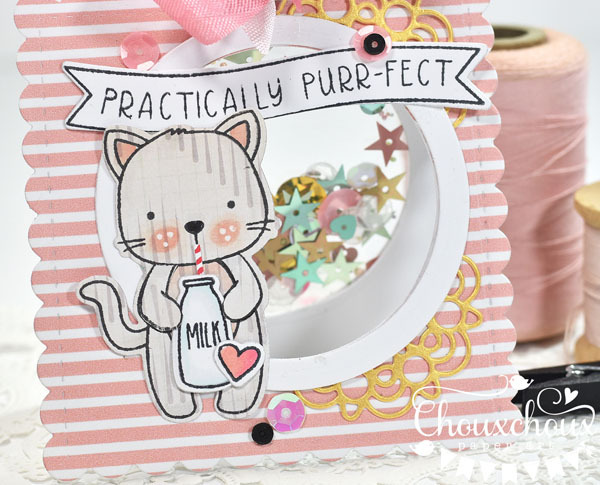 I LOVE your little kitties and love these fun ideas using the fuse tool! I've got a big smile on my face now! Thank you! Well you already know I LOVE kitties so I love to see your kitty projects! I watched your videos yesterday (I'm a subscriber) and it was so fun when your kitty interrupted. I couldn't figure out if it was one of my kitties or yours when I heard the meowing! So cute! 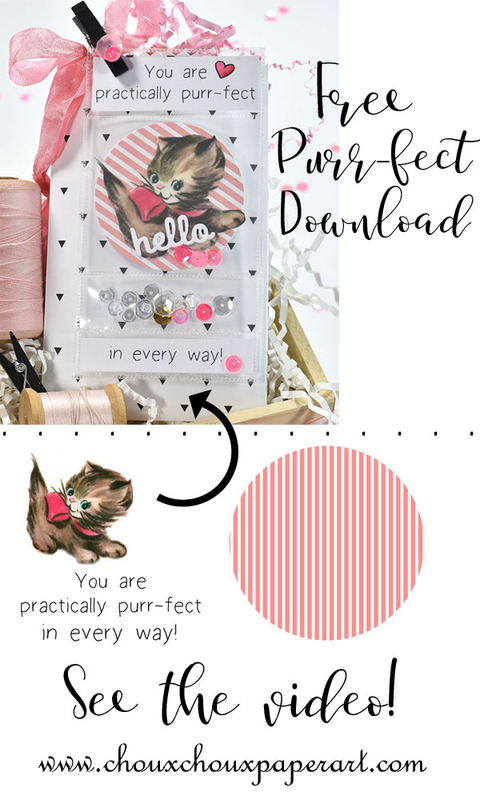 I love these projects and thank you for the cute download! I definitely need a fuse tool - I make a lot of shakers but I do them the old-fashioned way! I need to get with the program! Awesome projects! Love that Neat and Tangled stamp too - added to my wish list! Enjoy your day! Wonderful Lisa - you have me all excited with an idea -- I will have to let you know. I loved this video tutorials -- you are so dang good!! Oh wow! Your projects look fabulous! Wonderful tutorial too! I don't use my fuse tool like I should... I think I may need to pull it out now! Have a great day! Absolutely precious, Lori! Such a sweet, girly palette, and I love all the scrumptious trimmings! Over the top adorable, Lori! I'm a pink girl so these are both right up my alley! I really love the gold mini doilies--almost ordered them, again! Maybe one of these days! Hoping we don't get your high temps, but they say it may hit 100 over the weekend, so I'll be inside crafting! The cuteness of it all, Lori!!!! A-dorable!!! 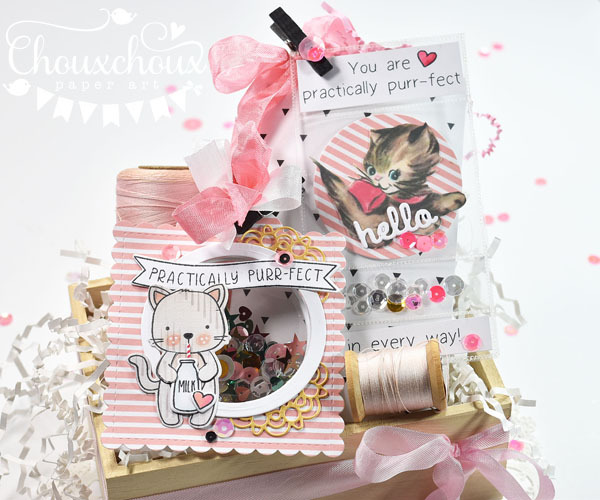 Lori your projects are adorable!!! I really love that fuse tool! Great videos and great idea to make a clear tag! Love that adorable kitty!! Just stopping by again to let you know I used another one of your kitty badge buttons...gosh I love those! These are fabulous!! I love cats so especially like this post. And I love that tiny straw! Good for you!! Hope things are a bit cooler for you today. It's been insanely hot up here in Canada so I can only imagine how things must be further south!! Garden Fun+Free Image and SVG!